Getting out into the real world to explore pieces of work in the flesh and engage in conversations with artists and arts professionals is an essential part of the experience for any collector. However, whilst this part of the journey can be the most exhilarating part of all, for newer buyers and collectors the prospect of getting out into the real world and starting conversations around art can be downright terrifying for fear of saying the wrong thing or feeling intimidated by the atmosphere. Sure enough, whilst some more traditional galleries and artists can be a tad stuffy and elitist, the truth is that most independent contemporary galleries and artists are extremely welcoming to new collectors and will only be too pleased to help you in your quest. 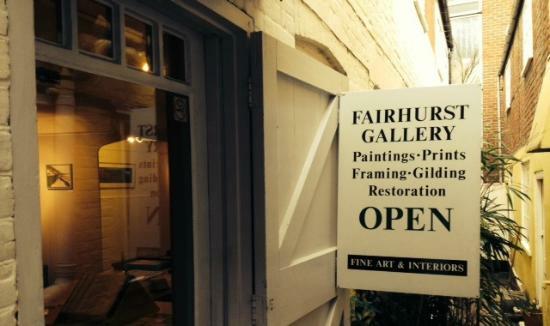 The Fairhurst gallery in Norwich are very accommodating to new collectors. If you’re not the type of person to just walk into a gallery and strike up an impromptu conversation, begin the process by conducting an online search for galleries, art fairs, open studios and art trails in your area or in a town or city that you’re due to visit. For each website that you visit, ask yourself whether you like the work they are representing and whether you get the right vibes from the website. If so, add them to the shortlist! Like going on a first date it’s always handy to have some stock questions up your sleeve before chatting to an artist or an arts professional. If encountering an artist perhaps ask them about what drove them to become an artist in the first place, what makes them tick and what their longer term ambitions are. For arts professionals, why not be bold and explain that you’re a new collector, show them some pieces that you admire and ask for recommendations. If you’re feeling a little anxious about the prospect of engaging in conversation in the real world then we recommend trying out your questions in an online environment first. This could be as simple as writing a comment on an artist’s piece of work on social media saying what you like about the piece or by sending them a direct message stating that you’re a new collector and that you’d like to know about the process behind the work or what their story is. Similarly, why not write an email to a gallery stating that you’re a new collector and that you’d like to find about about the type of artists they work with and how they go about selecting their artists. The added benefit of engaging in online conversations first is that it will give you a feel for the type of responses that your questions will receive and how the conversation will flow. In an online setting you also have the added comfort of being able to take your time and know that you can walk away at any time if you feel pressured or uncomfortable. Once you have identified some real-world settings that you would like to visit and are feeling good about your questions then the time has come to experience some art in the flesh! To boost confidence even further think about a friend or familiar face who could accompany you on your first visit. Who could you bring along to make it an even more memorable experience? An alternative or additional component to consider for your first real-world visit would be to engage a friendly consultant (like us!) to help you get even more out of the experience and develop additional confidence for a second visit. A common anxiety amongst new collectors when talking about art is the fear of saying the wrong thing. Well, the liberating truth about sharing perspectives on art is that there are simply no right and wrongs. Just because a seasoned art dealer or gallery owner has a certain opinion about a certain artist doesn’t make it true. Just because an artist’s interpretation of their work differs to that of a buyer’s interpretation doesn’t make the buyer’s view wrong. Just because someone has a high-flying art degree doesn’t make their response any more worthwhile than the man on the street. The fact is that we each have a different perspective on life which is shaped by a unique blend of beliefs, memories and experiences that can be triggered, or not triggered, when viewing a work of art. So take heart from the fact that art is the ultimate celebration of perspective, not an exercise in being right or wrong. They say that good things come to those who wait, and the same goes for collecting. So use these new techniques to explore art in the flesh and start new conversations whilst keeping in mind that your tastes will probably evolve quite rapidly when indulging in the real-world process for the first time, so never feel obliged to jump straight into making a purchase. Let that confidence build up steadily, enjoy the experience and only make that first purchase when the time is right.